Greenfield Architects performed exterior and interior renovations to provide a new upgraded look to the entire Entry Courtyard area, providing a fully accessible and ADA compliant building Entry. 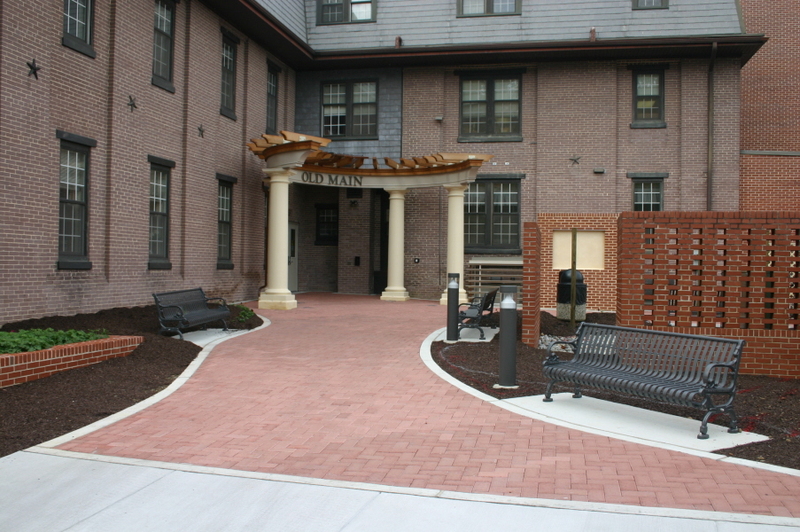 Exterior renovations included providing new sidewalks, curbing and landscape plantings and accessories, replacing concrete stairs, repairing planter beds and walls at the Basement, removing courtyard pavers and concrete and providing new pavers, removing ramps, steps and handrails, and adding a new Canopy/Pergola structure. Interior renovations included the upgrade of the existing interior stair and entryway to be a main access point to the building; providing new doors, hardware, card access systems, new finished interior walls, ceilings, flooring, lighting and paints throughout the stair tower; including recessed lights and wall washers for display wall.